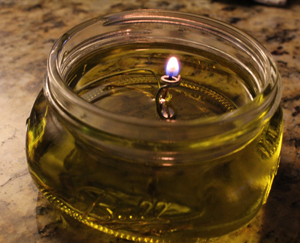 Olive oil lamps are a beautiful alternative to a candle and can be quite easy to make. While you can buy premade olive oil candle wicks, they can be somewhat expensive and it is really quite easy to make them yourself with materials you might already have on hand. 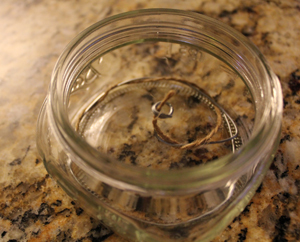 Shape the wire into a circle with the pliers, bend one end upward toward the center and form a loop to hold the wick. Slide the wick through the loop and wrap downward around the wire. The thicker the wick, the larger the flame you will have. 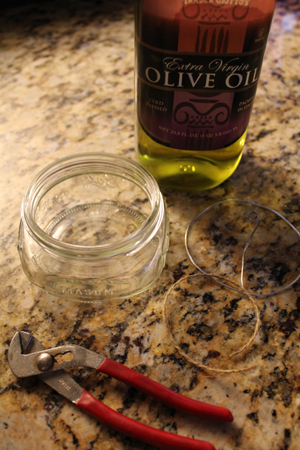 Place the wire and wick assembly into the jar and fill with olive oil until just below the bottom of the loop. Soak the wick completely with the oil and allow the oil to absorb into the fabric before lighting it. Oil candles are a great alternative in an emergency if you don’t have any wax candles available. They are also great for everyday use if you love candles, but want a more eco-friendly source of ambience. Using a high quality olive oil burns with no noticeable scent or smoke and can last for quite a long time. Remember to always use candles with caution and never leave burning unattended.